At Custom Eyes Optique & Eyecare, Dr. Christa Kim and our entire Frisco optometry team are committed to providing advanced vision care in a professional and comfortable environment. As an optometrist in Frisco, our primary eye care service includes a complete eye exam that analyzes eye health and vision function. In addition to eye exams and vision testing, Dr. Kim and our team of optometry professionals provide testing for glaucoma, cataracts and macular degeneration. Our Frisco optometrist also offers glasses, contact lenses, and pre- and post-operative care. Routine eye exams are an important part of good healthcare. The most thorough eye examination not only determines best type of vision correction for your needs, but also includes evaluating eye muscles as well as the internal health of the eyes. 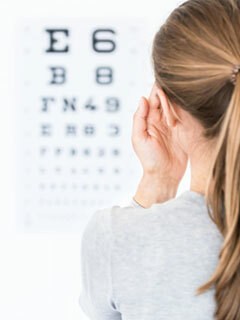 In some cases, eye or medical problems without symptoms can be discovered during a routine eye exam. We offer the latest technological equipment to test and customize your eye care. Dr. Kim will provide you with the best possible care from eyeglasses and contact lenses to eye emergencies and the treatment and management of eye disease. Dr. Kim is able to provide your entire with family with the proper exam. Each room is equipped with pediatric eye charts to see children from as young as 1 year old. In addition, Custom Eyes is handicapped accessible according to ADA regulations. Dr. Kim has extensive training and clinical experience with the fitting and management of all contact lens cases. Proper contact lens fitting, instruction on proper lens care and follow-up care are all important to a perfect fit. We fit all types of contact lenses including the newest disposables, bifocal and colored contacts, gas permeable lenses as well as alternative lenses to refractive surgery (CRT). Patients with dry eye syndrome, with high astigmatism power, and even needing bifocal lenses are now able to be successful contact lens wearers. So whether you have blurred vision or just want to change the color of your eye, Dr. Kim will help get the contacts that are right for you. Laser assisted in situ keratomileusis, commonly referred to as LASIK, is a corrective alternative to glasses or contact lenses. Like glasses or contact lenses, LASIK is a method for treating refractive conditions including nearsightedness (myopia), farsightedness (hyperopia), and astigmatism. At Custom Eyes Optique & Eyecare, Dr. Kim provides pre- and post-operative exams for LASIK and other eye procedures. Call 214-387-7770 today to schedule an examination to see whether you are a candidate for LASIK. Instead of seeing the standard manual equipment (“Which is better, one or two?”) in our rooms, you’ll experience the fully automated Vision Diagnostic System by Marco. Dr. Kim will guide you through a faster, more accurate, and patient-friendly method of performing eye exams. The Marco TRS system helps you to instantly compare a patient's vision in three ways: (1) without correction, (2) using a previous prescription, or (3) using the new prescription, with a single touch of a button. This comparison helps our patients more readily accept a change in prescription, as they see their vision improve immediately. We understand that eye diseases and eye injuries can be alarming and an urgent issue. Dr. Kim is board certified and has advanced training to prescribe medication to treat conditions like conjunctivitis, ocular allergies, iritis, and eye emergencies. Eye injuries are treated in a timely and efficient manner to get you immediate relief from any discomfort that you might have. Examinations also include tests for glaucoma, cataracts, macular degeneration, and the ocular effects of many general health disorders. Common systemic conditions detected on a routine eye examination include diabetes, High Blood Pressure and High Cholesterol and many neurological conditions. Do your eyes feel dry, itchy, or burn? Do they tear often or look red? Dry Eye Syndrome is very uncomfortable, but very treatable. Over the counter lubricating eye drops may temporarily relieve dry eye symptoms. However, a few minutes after placement, 80% of eye drops drain away from your eyes down into the nose and throat. Lacrimal plugs or occlusion can give long term relief. This is a partial blockage of your tear drainage ducts to preserve lubricating natural tears on the surface of the eyes. This simple, painless in office procedure may provide you with long-term relief from dry eye symptoms. These small plugs are available in dissolvable and non-dissolvable versions for personalized treatment. Ask Dr. Kim if you are a good candidate for this procedure. Computers are integral part of our daily lives. From school age to adulthood, many of us spend countless hours in front of the computer. This type of sustained deskwork or reading is stressful on our eyes. In addition, at the magical age of 40-45 years, our ability to focus near objects and clarity of vision changes. This problem becomes exaggerated on the computer without proper vision correction. Dr. Kim can provide customized recommendations for computer lenses which allow for more comfortable focusing, suggestions for special tints and coatings on lenses that will make computer screen viewing easier and less fatiguing. CRT is a perfect alternative to LASIK. Are you afraid of complications from eye surgery? Are you too young to have refractive surgery, but are interested in its benefits? Corneal Refractive Therapy is a safe non-surgical, reversible method to gently molding your cornea to improve your vision in a matter of hours to days. This is how it works: A patient wears the contact lens to sleep, which gently molds the cornea to have little or no prescription. Upon waking, the lens is removed and clear vision is achieved throughout the waking hours. This FDA approved procedure is an excellent way for children to reverse their prescription. Dr. Kim is not only certified in fitting these overnight lenses, she has been a successful CRT wearer for over 12 years. Ask if CRT is an option for your vision correction.